Image: JGI/Jamie Grill/Blend Images/Getty Images. Bright lights, certain smells, foods and drinks, exercise, stress, too much sleep, too little sleep: If any of these terms made you flinch, then you might be a might be a migraine sufferer. Migraines may feel like the pinnacle of pain, but what you may not know is, they actually can get worse. That’s why, for those of you who suffer from migraines consistently, knowing the signs your migraine can lead to more serious health conditions should be at the top of your to-do list. While it is important to note that, a majority of the time, migraines aren’t indicative of any larger health problem — according to Dr. Paul Michael, an oncologist with Comprehensive Cancer Centers of Nevada, a practice within the US Oncology Network — it’s still important to understand the difference between a “just a migraine” and when you should head straight to your doctor or the emergency room. When is your migraine just a migraine? If your headache always happens soon after certain activities, such as eating a big meal, drinking wine, working on the computer or watching TV for long periods of time; coincides with your menstrual cycle; or if it goes away after a few hours, then it’s most likely nothing to worry about, Michael says. There are three red flags to look for when determining if your migraine is more than a migraine, Michael says. Does the pain wake you up in the middle of the night? According to Michael, if you feel pain so severe it wakes you from sleep, then the pressure from lying down could mean that there is a tumor or something else serious. Martin Allen Samuels, director of the program in interdisciplinary neuroscience at Brigham and Women’s Hospital, tells Vice in January 2018, however, that if a headache or migraine wakes you up early in the morning, particularly linked to nausea or vomiting, then it’s time to seek medical attention. “There’s a small chance that could indicate that a brain tumor is taking up space inside your skull,” he says, adding that these headaches still turn out to be migraines when checked on a CT scan or MRI. And according to University Hospitals’ neurological surgeon Nicholas C. Bambakidis, MD, a headache or migraine that’s new or unusual and accompanied by neurological symptoms, like numbness or tingling in a limb, then it could be a sign of a brain tumor. “They tend to be worst in the morning and late in the day, and often occur with nausea and vomiting,” he says. More recently, a new study published in J Headache Pain in November 2018 found that prior migraine history is associated with brain tumors, and the risk is higher among men than women. According to the study, more than twice as many patients with brain tumors had prior migraines compared with the controls. 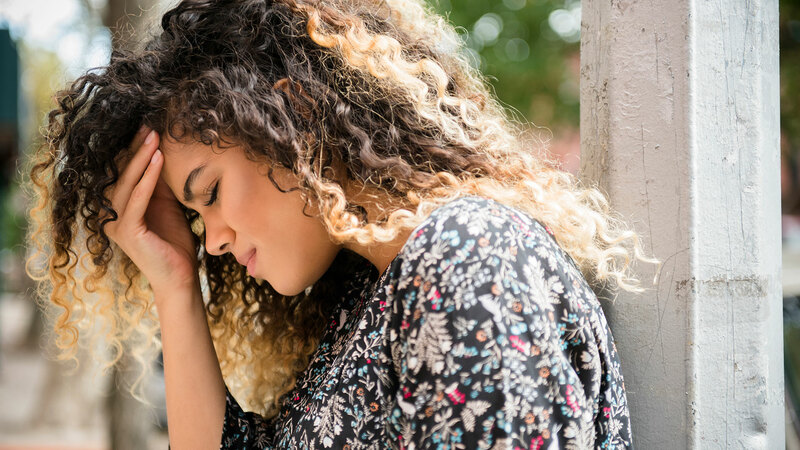 According to Nauman Tariq, director of the Headache Center at Johns Hopkins Medicine in Baltimore, chronic headaches could lead to another diagnosis. “Fifty percent of people with chronic headache also have anxiety and depression,” he tells the Washington Post in an interview in January 2018. Does it cause any mental or physical changes? A headache that results in noticeable personality changes (such as heightened anxiety or aggression) or physical changes (such as weakness in your arms or legs) is a serious problem. For instance, headaches accompanied by weakness in the face, arm or leg; numbness, visual impairment, language or speech problems; confusion, altered wakefulness or seizures should be attended to immediately as these could also be signs of a stroke. According to a May 2016 study published in the British Medical Journal, women with migraines had an increased risk for major cardiovascular disease and stroke. “We found an approximately 50 percent increased risk for major cardiovascular disease,” the study states. Therefore, it’s recommended by UCI Health pain management specialist Dr. Rakhi Dayal to see your doctor for clinical evaluation and tests. Any of these three signs would necessitate an immediate call to your doctor’s office. Michael adds that if you are vomiting uncontrollably, lose vision suddenly or the pain suddenly gets super intense, then you should skip the phone call and go straight to the emergency room.